Richmond Vertical Standard Wall One Line Plaque in Oil Rubbed Bronze. Richmond Address Plaque will accentuate your home exteriors with its elegance. The address plaque is made from rust-free cast aluminum providing excellent quality. 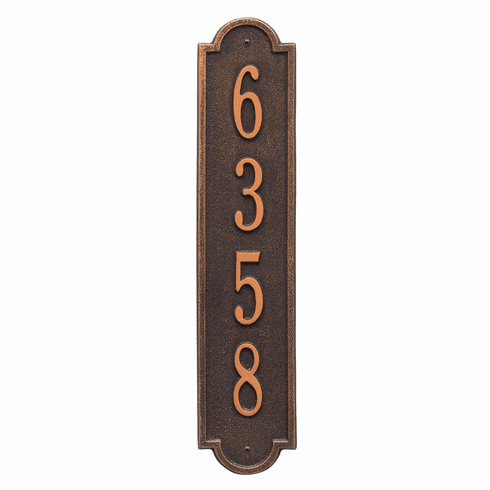 Tall and slim, it is a good choice for entryways that need a Vertical Address Plaque. Cast from recycled aluminum - will not rust. Aluminum shield coating. All Weather Coatings. Enhances curb appeal while adding value to your home. Personalization is permanently cast into the sign. Please check for accuracy; personalized orders cannot be modified, cancelled, or returned after being placed. Made in USA. It can hold up to 5 characters 3 inches in height or 7 characters of 1.75 inches in height.